Guarantee your songs get played and heard on streaming radio stations to a targeted audience. Track your success with real time, in depth analytics to learn how fans react to your music. Your songs are integrated into the service and each play includes links to your artist pages so you will build your fan base and exposure to increase your sales and royalties. There is no subscription commitment. You can decide to add more credit at any time for additional plays, and you only pay if your song is listened to for more than 30 seconds. Symphonic Distribution record labels and artists receive 25% match to 400 free plays. Click here to get your music heard now! Easily upload songs you would like to promote. Include your SoundCloud and YouTube URLs and we’ll play them where it’s applicable to increase your play counts! Specify your target audience by genre, gender, age, location, keywords, and more! Your songs will only be played to a relevant audience in your target audience. Let your music act as your best advertisement! Instantly receive song plays inside streaming services and amazing, real time, in depth analytics designed specifically for tracking music. Understand how people perceive and interact with your music. Seamless integration – Your content is integrated into the streaming service natively so the listener can interact with it utilizing the same in service functionality as any other song. Real time analytics designed for music – Understand in real time how people interact with your music by analyzing song plays, plays over 30 seconds, engagement, where in the song people engage, skips, age, gender, location, and more! Artist spotlight & social media engagement – Included with each play is an Artist Spotlight with links to all of your social media pages, artist name, song name, a descriptive bio, and an image. 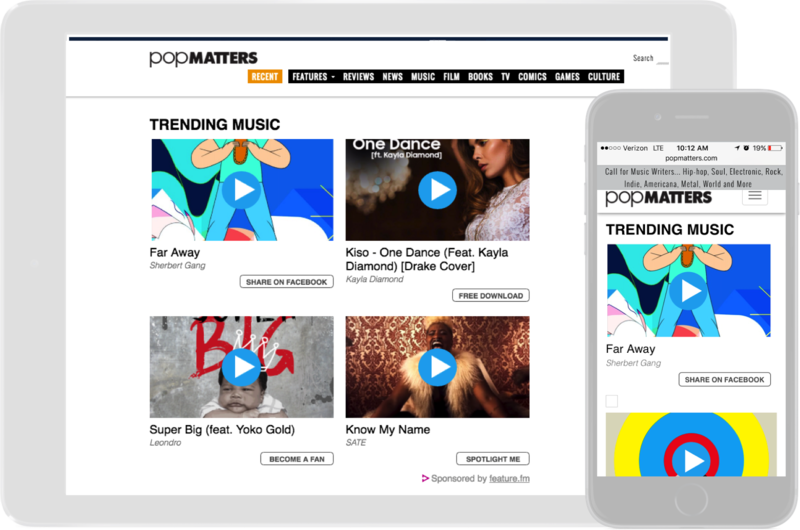 Share your songs – Share your approved campaigns on your social networks to receive more free plays that are tracked in your analytics. Digital promotion designed specifically for music – Our mission is to help you gain exposure for your great music! We personally put in the effort to help promote your music as much as possible. With monthly top mixes on 8tracks, social media shout outs, industry contacts, and as a rising tastemaker, we are here to help you gain exposure in any way possible!